Sheffield United manager Micky Adams has said it was Arsenal defender Kyle Bartley's decision to end his season-long loan spell at the Blades. 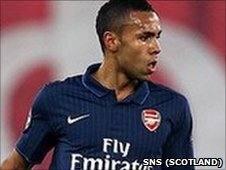 The Arsenal defender opted for a loan move to Rangers when the Blades signed Neill Collins from Leeds on Monday. Adams told BBC Radio Sheffield: "We wanted to bring in another centre-half and Kyle felt it would maybe hinder his selection and wanted to leave. "If people want to leave the club, I'm not going to stand in their way." Bartley was in his second loan spell at Bramall Lane, having originally joined for three months in February 2010.